We are delighted to host the 50th Annual ASEEES Convention, Dec 6-9, at the Boston Marriott Copley Place, at 110 Huntington Ave, Boston, Massachusetts, 02116, 1-617-236-5800 [google map]. The Convention offers over 640 sessions, a presidential plenary, a film series, exhibits, and many other special events to celebrate the 70th anniversary of ASEEES’s founding. We thank the Convention Program Committee for their hard work on this truly exceptional convention! Please find below some useful information about the convention, ground transportation, and the city of Boston, Massachusetts. You forgot to register or weren't sure you wanted to attend? You can still register on-site at the convention. Please join us! While you can always view the convention program on our website, we also offer a mobile app. You do not need to be connected to the internet to use it once it has been downloaded. For instructions see www.aseees.org/convention/mobile-app The print program will be available when you pick up your badge. Please wear your badge during the convention; we will be monitoring badges for registration. The registration/badge pick-up desk opens on Thursday, December 6 at 9:00 am ET at the 4th Floor registration desk. The first session begins at 12:00 pm ET on Thurs, Dec 6; the last session ends at 1:45 pm ET on Sun, Dec 9. Please carefully review the Audio-Visual equipment policy. You will need to bring your own laptop and presentations on thumb drives as there is NO Wi-Fi in the meeting rooms. For example, you cannot stream a video from YouTube. You need to download it to your laptop first. We have set up a presentation prep room on the 4th floor in office A, next to the registration desk. If you are a panel member, please review the panel best practices and the paper upload/download information. We have 440+ first-time attendees, whose name badge will include a green ribbon. We ask our regular attendees to extend hospitality and assistance to those wearing the green ribbons—we all remember how overwhelming the convention was the first time we attended. See the rules on recording and social media. Please review the anti-harassment policy. IREX 50th Anniversary Alumni Reception, Thur, Dec 6, 8:00-9:30 pm, Grand Ball Room Salon C - As IREX celebrates its 50th anniversary, IREX alumni and friends attending the 2018 ASEEES Convention are invited to reconnect at a celebratory reception. Free food and refreshments provided. Cash bar available. Please RSVP here by December 1, 2018. Film Series – This year we are featuring six screenings, plus a private screening hosted by the Harvard Ukrainian Research Institute. The annual meeting of ASEEES members is on Thur, Dec 6, 6:00 – 6:30 pm, Salon F; all ASEEES members are invited to attend. 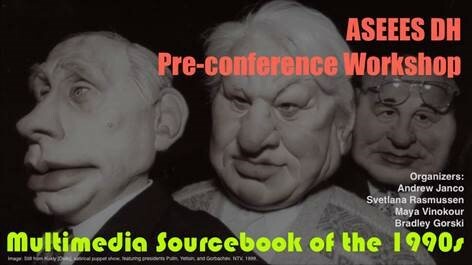 ASEEES officers will present reports on the state of the Association. The Opening Reception and Exhibit Hall Tour is on Thur, Dec 6, 6:30-8:00 pm. Join us for appetizers and a cash bar and tour the 70 booths by 65 exhibitors. Take a photo in booth #117 and tweet it to #ASEEES70 for your chance to win valuable prizes. See sign in the booth for more information. The Award Ceremony and President’s Address on Fri, Dec 7, 6:30-8:00 pm in Salon F is open to the public. Join us to congratulate the 2018 ASEEES Prize winners. Julie Cassiday, 2018 ASEEES President, will give her address, “Presidential Performances”. AnniversaryCelebration Dance Party, Sat, Dec 8, 8:30-11:30pm, in Salon F, RSVP Here, Sponsored by the Fund for European University at St. Petersburg. Will feature the Klezmer band, Ezekiel’s Wheels, followed by your favorite DJ Dance music until 11:30 PM. Light appetizers, dessert and cash bar. If you are staying at the convention hotel and booked the room through the ASEEES room block, Wi-Fi is complimentary in the guestrooms. You must log on daily and “accept the $12.95 charges” for regular Wi-Fi option but you will not be charged. The $16.95 high-speed option is not complimentary and you will be charged for each day that it is used. Hotel map, transportation, and parking info (including parking apps to find cheaper parking) can be found here. For more information on nearby restaurants, attractions, and sites, chosen specifically for our Convention attendees, see our “Visiting Boston” page! The Convention mobile app has a feature that lists and maps restaurants and attractions in Boston. Please check out the app! ASEEES office in Pittsburgh will be closed Dec 3-10 for the convention. We will reopen on Dec 11. The online membership renewal will be disabled Nov. 30-Dec 9. You can renew your membership at the on-site registration desk, or after the convention.